Be warned: everything is not as it seems. From moving pictures to spectacular pop-ups and a 3D sculpture that follows you around the room; get ready to open to doors of perception with “Optical Illusions”. 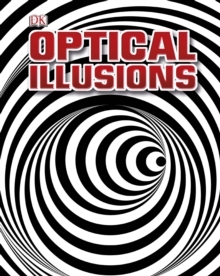 50 incredible optical illusions are found within, covering impossible objects, distortions, ambiguities, illusions of brightness and much more. Even the cover will make your mind boggle as it defies you NOT to open this amazing book. Each flap or tab takes you to another level of illusion, allowing you to reveal the solution yourself. There are more tricks up its sleeve too – interactive elements on every page and explanations of the latest theories as to how illusions fool us all.